Using established Rush Soccer methodologies and practices, highly qualified international coaching staff, over 30 years of excellence of player development in North American society, international resources and contacts, add new dimension to the youth players development in Ontario / Canada and become major vehicle in implementation, realisation and continuous improvement of the LTPD program. 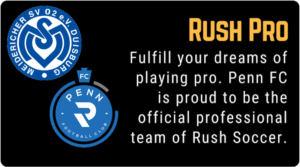 The Rush Academy is a leading USSF Academy, dedicated to becoming a leading Soccer Academy in Canada in implementation of LTPD program and development of high quality players within this environment. Proven record in development of highest level of youth, collegiate, professional, national level players and the most competitive teams in North America (see information on individual and team success). Challenging and rewarding development environment for gifted players providing top level training per proven methods and by most qualified coaching staff at high quality facilities, highest level of competition locally and internationally and within club structure, extended selection for most talented players and exposure to international scouting community (US College coaches, MLS coaches, European coaches). Rush Canada Soccer Academy is local representation of the great North American Soccer Operations providing family and player friendly environment needed to create optimal conditions for development of youth players.